Today I’m thrilled to have Spencer Haws back on the show. If you don’t remember him from Episode 54, Spencer runs the popular blog NichePursuits.com where he teaches others how to start niche online businesses. He was one of the speakers at the Sellers Summit talking about SEO. He’s also the creator of Long Tail Pro which is one of the best keyword research tools on the market today. But recently, he decided to sell that business and being the nosy guy that I am, I wanted all the details. Enjoy the show! Why Spencer decided to sell Long Tail Pro. What services he used to find buyers. The pros and cons of using a broker. How much do they charge? How developer support works when selling a software program. What he looked for in a sales partner. How the sale was structured. Steve: Welcome to the My Wife Quit Her Job Podcast. Today I’m thrilled to have Spencer Haws back on the show. Now if you don’t remember him from episode 54, Spencer runs the popular blog nichepursuits.com where he teaches other people how to start niche online businesses. He is also one of the speakers at my first conference the Sellers Summit and he spoke about SEO. He is also the creator of Long Tail Pro which is one of the best keyword research tools on the market today. But recently he actually decided to sell that business and being the nosy guy that I am, I wanted all the details. So I brought Spencer on the show to talk about the sale and also to see what he is up to right now. And with that welcome back on the show Spencer, how are you doing today man? Spencer: Thanks Steve, it’s great to be back on the podcast, and I’m doing great. I’m sitting in a new house, we just moved a couple of weeks ago. And so I’m breaking in this office with your podcast here. Steve: Yeah, we were joking how Long Tail Pro money bought that house. Spencer: That’s right. Definitely there was a little bit of Long Tail Pro money that helped us decide we should move. Steve: So we actually covered your bio back in episode 54, and I don’t want to rehash any of the old things that you said. So let’s just jump into the meat of it. First and foremost I am very curious why you decided to sell Long Tail Pro, which was like your baby for so many years right? Spencer: Yeah absolutely. So I did, I started Long Tail Pro over five years ago. It’s been my baby working on it day in day out for five years. And I am — I was the 100% sole owner. So I decided to sell it for a couple of reasons. One is I had been working on it for a really long time and grown it to a certain point. And anytime that you do that I feel like maybe it’s time — I felt like maybe it was time to take a little bit of money off the tables, right? And just—I had put a lot of effort in and knew that it was a valuable business, and perhaps I felt like I needed to take some cash off the table. And sort of the other side of that coin, the other reason is when you have so much of your business sort of in one thing, right, Long Tail Pro is doing very well, and I would have hated to see it start to decline. So there is a lot of risk especially when you’re relying on Google, I was always worried — and as business owners maybe we worry too much about things that don’t ever happen. But I always think about what if Google changed how keywords worked and how they ranked websites and that sort of thing. So I felt like there was risk there. I felt like you know what, I have had a great run, I’m going to take some money off the table, take some risk off the table and hopefully let somebody else take it to the next level. So that was my couple of reasons for selling the business. Steve: So when you are talking about Google making changes are you referring to just them taking away like the keyword API and stuff like that, that could just totally destroy the business? Spencer: Yeah that definitely was the prominent reason I would say. If they would have shut down the Google Keyword Planner or yeah any APIs, that’s really where we were getting a lot of the data right? And that would have been devastating to the business. Steve: Has that happened at all in the past five years, where Google has made some sort of drastic change and you had to adjust with Long Tail Pro? Spencer: Yeah that definitely did happen. Before the Google Keyword Planner I believe it was just called the Google Keyword Tool, and that was two and a half three years ago where they made that switch. And that was quite a dramatic shift, because we had built our software on the old Google Keyword Tool. So we had to re-program how we were gathering data and everything. So that’s quite a large change that had me scared for a long time two or three years ago. So I went through that and everything was fine. But yeah there definitely had been changes and we had always been able to adjust along the way. Steve: Okay in terms of maintenance, was it a lot of work towards the end? Spencer: In terms of maintenance as far as just coding, or just business in general? Steve: Just in general like how many hours of your day was devoted to Long Tail Pro? 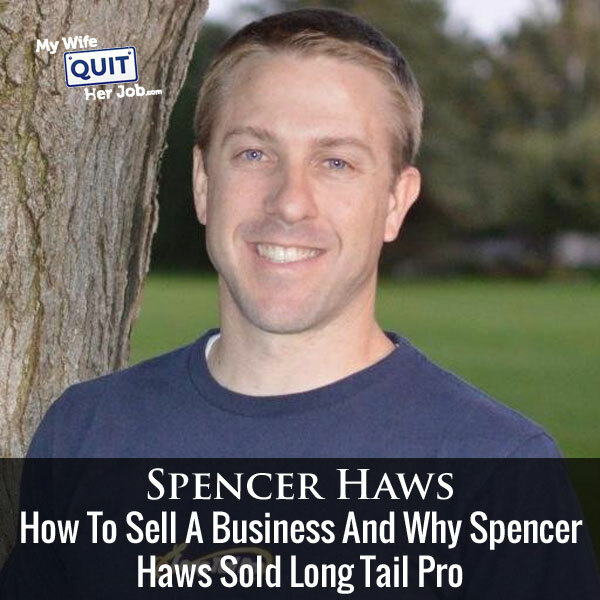 Spencer: I would say about half my day was devoted to Long Tail Pro, the other half was other projects, Niche Pursuits and my other websites and things like that. I really had setup processes and had people helping me out, a customer support team, I had developers, and Jake had really become my affiliate manager and sort of outreach person. So really it had become fairly hands off in a way. I just worked on the larger strategic decisions or putting fires out when that happened. So it’s about half my day I would say. Steve: So from a marketing school were you doing mostly marketing work or? Spencer: Yeah I would do — that’s probably marketing and then just management overall, right? So marketing, strategic marketing, reaching out to different contacts or setting up special offers. Or yeah just tweaking sales pages and that sort of thing is primarily what I was doing. Steve: Okay and so can we talk a little bit about just multiples real quick before we get into the guts. Like it’s a software company, and what multiples typically are there for software companies for sale? Steve: Earnings or revenue – earnings, right? Steve: That seems really low considering ecommerce stores get like 3X. Spencer: Yeah, and it can depend on the size. I mean if — a good market place to look at if people go to Empire Flippers, that was their standard for a long time was a 20 times monthly earnings. They’ve since — because they are primarily dealing with smaller websites under $250,000 and a lot under $100,000. So 20 to 25 is roughly what they sell for. And then as you get a little bit bigger, or just depending on the company it can be 3X or plus, right? Spencer: Yeah mine was just slightly over 3X. Steve: Okay, all right got it. And was it — so it sounded like you weren’t spending a whole lot of time on it, and so 3X means — so 3X earnings. So like did you ever feel at any time that why don’t I just run this for another 3 years, and then just take the money, because it was relatively low effort, right? Spencer: Yeah I know it was relatively low effort, and again it just sort of the thing that kept me up at night were just the risks involved. I felt like if Google changed anything, and I also should say that when I had built the application, it was built on Adobe Air which is a fairly old platform. Maybe back in 2010 it was still in its heyday, but now it’s not. And so there was always some work around with that. So I just– yes I certainly thought about yeah I could just write this and collect the earnings for a few years. And that would have been an okay move, but then the rest just kept me up at night sometimes, and the opportunity arose to sell it, and so I took that opportunity. Steve: Okay, so let’s say I want to sell my company, like can we just kind of talk about the process involved, like what was your first step? Spencer: So yeah absolutely, I really didn’t know, I had never sold a large property before. I have sold a few websites here and there, but I had never sold a software company, and this is the first software company I had built. I really didn’t know the process. So my story maybe won’t match up with what other people do, but I actually ended up going to Rhodium weekend it’s a conference primarily for people buying and selling websites. Steve: What is it called sorry? Spencer: Yeah, and I have been to it before and so I knew that this guy, a lot of web brokers attended this type of conference. So I actually reached out a few weeks before this conference took place and started chatting with Chris Yates, he’s the one that puts on that conference and just saying hey I’m considering maybe selling Long Tail Pro, do you have any tips? Spencer: And we started discussions there and that person or that group ended up buying it from me. Steve: Can we talk about like what was going — what are the pros and cons of using a broker? Like why did you decide to go with that person who contacted you instead of getting perhaps like a bidding word going? Spencer: Yes so there are definitely some advantages to going to a broker, because as you mention they can reach lots of potential buyers. They do charge a brokerage fee, which I was basically able to avoid by not going through a brokerage. Steve: Do you know how much that is? Spencer: Well — I should have come better prepared for the percentage, it’s usually a percentage off of the top, and I don’t recall what it is off the top. Steve: Was it double digits though, or single digits? Spencer: Yeah it is close — that actually maybe it’s very close to 10%. It maybe 10% like FE International maybe right around that. Don’t quote me on that, but I believe it’s pretty close to 10%. Steve: So it’s significant basically? Spencer: Yeah, it is a significant brokerage fee, but they typically do a lot of work. They get all the due diligence, paper work in place and present that to potential investors. I went with the group that contacted me first, because I had also looked at the multiples that similar software businesses were being sold for, and their bid was very competitive with what I believe I would have gotten anyways. And the process was much quicker going privately just because they had a different and faster due diligence process than maybe other potential buyers would have. So there is a few to less headaches there, because I actually knew the potential buyer — I had known the potential buyer for a few years actually. So all of those things sort of added up competitive, multiple, less due diligence, smaller brokerage fee, or no brokerage fee, and I already knew the potential buyer. I had some trust there, and I felt like they would do a great job with the business, so I just went with it. Steve: Can we talk a little bit about the due diligence process, like what are some of the things that they ask for, did you have to do any work involved? Spencer: Yeah, they asked for all financials, so basically 3 years worth of financials, and in my case for the last 12 months they wanted a breakdown of all revenue and expenses broken down by month for the most recent year, and then just the 2 previous years before that, just an annual breakdown essentially. Steve: When they ask for this, do they need an independent party to audit it, or is it just based on your accounting? Spencer: They did it on my accounting, and that definitely could be different based on the potential buyer, so they essentially just asked me, what are your numbers? They did ask for logins, so they were able to login or get screen shots of a lot of different revenues or expenses. They actually got my affiliate logins so they could see what affiliates were doing what, and those sort of things, so they did verify with logins as well. It was a lot of work, but I believe it is a lot less work than if I had gone with other potential buyers. Steve: So they go in, and they look at all of your numbers, were there any other factors involved that they were looking for, and let’s talk about those? Spencer: Yeah, I mean they really want to look at all aspects of the business, and they are thinking about what are the risks here, and one of the risks in my case is they felt like, “Well if Spencer stops promoting or mentioning Long Tail Pro on Niche Pursuits, that’s a big chunk of the business, because definitely nichepursuits.com has always sent a lot of traffic over the Long Tail Pro. And so there was some clauses in there stating that I would continue to write about and keep all my existing links on Niche Pursuits for the next 3 years. Those sorts of things, and then there was definitely strong non compete clauses, you know I can’t go out and create another keyword research tool for a number of years, those sorts of things. A lot of that due diligence as far as I need to keep putting in some work, because I am so integral to the business, and that I can’t go out and compete directly with the existing company. Steve: What about your email list and social media properties, are those all part of the deal as well? Spencer: Yes, that was all part of the deal, and that was definitely a big part of the deal was the size of the email list. I had to turn all that over to the new buyers, and certainly all the social media properties, and really everything associated with Long Tail Pro, and the brand was turned over to the new owners. Steve: When you turn over something like an email list, are you allowed to keep the people on the list for a separate list, does that make sense? Spencer: Right, that does make sense, no, I was not. So once I turned over that email list, I was no longer allowed to email them separately for other things. That list is theirs, they own it. Steve: You mentioned that you looked at other companies who sold at similar multiples, where did you find that resource that you could do such a comparison? Spencer: Yeah, so actually on FE International is where I found some similar software companies, and in fact on e of those was Hit Tail that was sold not too long ago. They were sold through FE international, so they actually provide– you can get– they provide the basic stats, what’s the multiple, what’s the earnings and those sorts of things. That was actually a very direct comparison, and my multiple was very similar to what Hit Tail sold for as well. Steve: When you are thinking about this multiple, like what other factors go into it. I would imagine growth, and a whole bunch of things outside the immediate numbers fall into play, right? Spencer: Right, yeah you are absolutely right, and it’s not an exact science either. I mean it’s something that can be negotiated. Certainly growth, and market potential, and other things that might come into play can increase or decrease the eventual selling price, and it was one of those things where the potential buyers presented a multiple, and then we negotiated from there. Steve: Okay, what I was trying to get at actually was Long Tail Pro is still growing every single year during the sale? Spencer: Yes, Long Tail Pro has grown every single year that I have owned it, and it’s still growing. Steve: Okay, and in terms of marketing, like from their perspective was there any more clauses for you to continue to help market, or did you turn over the marketing all to them? Spencer: There were some still some clauses for me to continue marketing. For example whenever there is any new major updates, they want essentially me to be available to blog about it on Niche Pursuits, so I have some ongoing commitments. When there is any big changes to the software, I need to mention that and promote that. For example the change has been going through to make Long Tail Pro cloud based, and so when that happens which should be very soon, I need to blog about that, essentially promote it, and say, “Hey now it’s cloud based, you guys should go check it out.” I do have those ongoing commitments to continue blogging, and doing a few other things if there is any big promotions to get involve a little bit there as well. Steve: Okay, and any software implications? For example let’s say I run a software company, and I want to buy Long Tail Pro, and I want to make sure that it could integrate in with my platform, were there any discussions about like leveraging your developer? Actually first question before that one, was the developer part of the deal? Spencer: Not really, they did talk with the developer before purchasing the company to make sure that he would come over, and the reason I say not really is because they had always planned to bring in their own developer anyways. My existing developer stayed on for– it was really only maybe 2-3 months before they had fully integrated their own development team, and transitioned out the old developer. Steve: Okay, and so did they do any like did you turn over the source code for them to do due diligence on? Spencer: Yes, we did give them access to view the source code, so they brought in their own developer to view that, and definitely do due diligence to make sure it was clean code, and easy enough to work with, that sort of thing. Steve: Okay, and naturally you had to sign some sort of NDA to see all this stuff, right? Steve: Okay, so how was the deal structured? Can we just talk about the negotiation process, like what were the important things that you wanted, and what were some of the things they wanted, and how did you compromise? Spencer: Yeah, absolutely, so I’m mentioned a couple of things that they wanted, a lot of it did surround me, and me still blogging about it, still being involved a little bit, and maybe I should back up, we didn’t mention this, but I still own some of the company. I still own 20% of the company. Spencer: I didn’t sell all of it because I still honestly I feel like there is tons of growth potential. I think it is a great business, and that was actually positive for them to have me still be a small owner because it aligned our interests. Both of us still want the company to grow, and do well. That was a lot of what they wanted anyways is for me to stay on. And so we did negotiate that a little bit as far as how much should I be blogging, and mentioning that, and we negotiated as I mentioned anytime there is a large update, what might be considered a large update to the software will be required to blog about it. Steve: How did you come up with 20%? Spencer: We played around with a couple of different numbers. I definitely wanted to sell the majority of it. There is really no magic reason, I think we initially started out at 25%, and I don’t know if this gets too much into the weeds, but it was a management group of 3 guys that essentially were leading the investment to buy Long Tail Pro. They brought in a number of other investors as well, to come in on the purchase, so there is about 15 total investors, that bought into Long Tail Pro. Just the way the numbers worked out, so that the 20% is where it landed with you know the investors and how much money they brought, and how much percentage I still wanted. I knew I wanted more than 10%, and anyways we just ended up with that number. Steve: I want to take a moment to thank ReferralCandy for being a sponsor of the show. Now in this day and age word of mouth is a huge driver of business for most e-commerce stores, and the best way to amplify word of mouth marketing is through a referral program, and this is where ReferralCandy shines. With just a couple of clicks to the mouse, you could add a referral program to your e-commerce store, and reward your customers for telling their friends about your shop, and this tactic works wonders. In fact it is not uncommon to get a ridiculous return on investment. For example Greats Footwear who is a ReferralCandy customer is currently seeing a 20X ROI. Referral word of mouth marketing is also useful for building up your social media presence as well, because everyone is talking about your company with their friends on Facebook, and Twitter. The best part is that ReferralCandy is a set it and forget it service, requires no technical set up, and they are giving My Wife Quit Her Job listeners 50 bucks to try them out if you go to promo.referrallcandy.com/Steve. Once again it’s promo.referrallcandy.com/Steve to get a $50 credit to try out the service risk free, now back to the show. In terms of your involvement though, the commitment basically for you for that 20% is just to continue blogging about the tool? Spencer: Primarily yeah, primarily and to not change anything from old links that I had or anything like that. I couldn’t go out and all of a sudden all the traffic I was pushing to change those links somewhere else, but yeah. Steve: Are you still expected to be somewhat like the face of the business? Spencer: No, not really, although they did– this also was another piece is they didn’t want me to talk about the sale for at least a few months, and so you are one of the very first times I have talked publicly about this. I sold the company in February, so it’s now been almost 6 months, so they want me to have a quiet period just so that existing buyers didn’t believe I had left the company. Spencer: I have been the face still of the company, but I’m going to be hopefully less and less so here now that I’m going to be talking publicly about it. Steve: Okay, and in terms of what you wanted out of the deal, what were some of the things that you were pretty adamant on? Spencer: Yeah, so I really wanted Long Tail Pro to go into good hands. I wanted somebody that had a similar vision to me, in that I believe the Long Tail Pro can continue to grow, and continue to serve the user base that we’ve served. There was a lot of little points surrounding that in terms of just the direction of the software, I wanted to make sure that we didn’t alienate our user base. Those were– the fact that they are moving it over to the cloud, that was something that I always wanted, and so really just a lot of things that they were going to do to the software is really reason that confirmed to my head, “Hey I should be selling it to these people.” In terms of negotiation of what I wanted, a lot of the negotiation was just surrounding the price. Once I sold it they were all on board with this similar strategy, price, and then just yeah my involvement. Steve: How long did this process take from start to finish? Steve: Like 5 months, 4-5 months. Spencer: Yeah maybe 3-4 months of talking and discussing, so relatively quickly actually. Steve: Yeah, that is really quick actually, and I noticed that they changed the model to a more SaaS based model. Was that something that you were planning on doing anyways or? Spencer: Yeah it was, it was something that I was planning on doing. It’s funny because I had taken a look at my business, and I was at the point, “Okay how do I take this to the next level? I need to strategize; I need to probably take it to the cloud. I probably need to make it a full SaaS model, so everybody is on a monthly plan.” I came up with a strategy, and then I decided to sell the company. I’m happy to say that yeah, they ran with the same plan, and have moved over to a full SaaS model, and done all of those things. Steve: Yeah, I remember in the back of my mind at least for the longest time, I was wondering how you could possibly support a single sale purchase model, and support these people, like you almost have to go to a SaaS model especially if Google is going to be changing everything from time to time. Spencer: Yeah, you really do, I mean had started Long Tail Pro, and it was a onetime purchase really to model Market Samurai, my top competitor at the time back in 2011. And that worked for a while, but I could quickly see that I needed some monthly recurring subscription, so it actually was in 20; I want to say January 2013, beginning of the year that I actually introduced Long Tail Platinum that was a monthly subscription. So definitely having a monthly subscription, recurring revenue was huge for the business, and there is no way I could have grown Long Tail Pro like I did without that piece. Steve: Okay, cool well you know Spence, let’s switch gears a little bit, and you know you have 50% of your time back, and so I’m just curious what you are up to now, like what are you doing with your time now besides buying houses and moving? Spencer: That’s right, now that the house buying is settled down, we are getting moved in, I do have a couple of more projects going on. One thing I partnered up with a couple of guys, and we have been out buying websites, and doing everything we can to grow those, and so I’m with some partners that we’ve been building websites for 10 plus years, each of us individually essentially, and so we have a lot of skills. What we decided to do is well why don’t we train others, give them our strategies for keyword research, and creating content, and doing link building to help us grow these websites, and then they can essentially do the work for us, and in exchange they get all those strategies and skills that they can go and use eventually on their own websites. This is the model that we have implemented. We have been hiring interns, they come, they work for us for a period of 4 weeks, they go through our training program, and then they help us grow these websites. We call it authority machine internship where we bring on a number of interns and they can learn from us, and work with us on some websites, and help us grow those websites, and then after the 4 weeks they go, and of course hopefully can work on their sites and see the same growth there. And because we have already set up a whole team to train others, and to give people, we’ve put together video tutorials and all these things. We also sell that package of training to people. If they don’t want to work on our websites and don’t want to go through the 4 week training and work for us, they can just buy the course or the training package, and go through on their own as well. Steve: This is a virtual training, like is there a live component to it? Spencer: Yes, it is a virtual training, we do have some webinars, but it is all virtual, work from your own home, wherever you want. Steve: That’s an interesting model, so you are getting interns, and I imagine they are just doing this just for the learning point where you are not compensating these interns, are you? Steve: They are helping you build your own authority properties. Can we talk about these authority properties? Are they for the purpose of affiliate revenue; are they for physical product sales? Spencer: They are all affiliate websites. Steve: Okay, so the goal is to rank these sites in search? Spencer: Correct, we are really good at SEO, that’s our background, so exactly we are trying to grow the search traffic. Steve: That’s interesting, because I remember in our last interview you used to, like way back in the day you had like hundreds of niche sites right, and then you transitioned to software, and then you transitioned over to physical products and e-commerce, and it seems like you have gone back. Would you consider these niche sites? Spencer: Yeah, I mean, I don’t know what the right phrase is, there are larger websites, but they are. They are definitely focused on one niche, or one area, so I would call them niche sites, but there is something that we hope to grow into much larger properties. I mean to give you an example, one website that we purchased just a few months ago, we’ve since added 500 articles or pieces of content to that in a period of a couple of months, so these are large properties, but they are really focused on one niche. Steve: I see, so to produce that much content, I guess you are, are you paying people in the US, or are these interns doing the content building? Spencer: Yes, so the interns are doing the content creation, so that’s the work that they put in, they get all the training, and see the internal workings of our website and our strategies, and then they have to write like 10 articles in a period of 4 weeks, so that’s some of their payment in exchange for the training that they get in working with us. Steve: Can we talk a little bit about just content creation real quick, so I noticed that the trend is more towards long form content now, as opposed to just quantity, so are these 500 posts, are they like beefy posts? Spencer: Yeah, so they are all roughly 1500 words long, so fairly decent sized articles. They are not short articles, and we do also create charts, and images, and maybe insert YouTube videos, so they are what I would consider fairly in-depth articles, all of them. Steve: Okay, and then you have some of these authority sites up already, can you comment on how much revenue they are generating? Spencer: Yeah, so one of them we purchased a few months ago, and it was making roughly $2,500-3,000 a month when we bought it, and we have now doubled that income, so it’s making $5,000-6,000 a month. We’ve more than doubled the organic traffic in about 3 months to that particular website, and their revenue is increased. It locks up with that, so we’ve basically doubled that. The other website that we purchased– well we purchased a few, we just barely purchased one a few weeks ago, so no results there, but the other website that we purchased also in April, so a few months ago. We have actually 5Xed the organic traffic coming to that website. Steve: Really, in what period of time? Steve: Crazy, okay, so since we’ve been on the topic of selling businesses, can we talk a little bit about your buying criteria? Spencer: Yeah, so for these websites we are definitely looking for established websites that are doing– we are primarily looking for websites that we know will do well in Google. The way to know that they are going to do well in Google is that they are already doing well in Google for certain key terms. So we look at these websites, we see what they are already ranking for, and we look at the authority of them, so have they been around for a long time, does it look like Google is treating them well? If they are we feel like that puts you so far ahead of the game already. We come in, we add tons of content, we have strategies for building lots of links to add even more authority, so that’s primarily what we are looking at is where is the traffic coming from, how well is it doing in Google, and how authoritative is this website? Steve: Of these sites that you’ve purchased, clearly the owners were not doing certain things, so are there any certain aspects that you are looking for? Like the quality of content or I don’t know, what are you looking for that can be improved upon? Spencer: Yeah, a lot of these websites, it’s not that the web masters were doing anything wrong, they were actually doing a lot of things right, you know to make them Google friendly, but like all of us myself included, we have projects that just fade, right? So a lot of these websites just haven’t been worked on for a year plus, right. People just sort forget about them, they have moved on to other things. The first website I mentioned that was making 2500 to 3000 a month, the people that owned this website they have much larger websites that they are working on, right? And so these are just little websites. So that is one of the things that we look at is how long has it been since people have added content to this. Is this something that they’ve forgotten about and just not putting any work into? Because that’s a lot of it, you just got to grind and put in the work and if you do that consistently you are going to see growth. Steve: And in terms of making money via affiliate, are they in some sort of niche that you kind of specialize in, or they are all across the board? Spencer: Right now they are all across the board, so ranging from health to computers and really kind of just across the board. We do have a couple of websites because we are trying to buy websites essentially every month here as a business. Yeah we are pretty aggressive; we have quiet aggressive growth goals here. But we do have a couple of websites in the works that maybe in the blogging niche itself, right? And it may give us an opportunity to not only grow these websites that are already valuable, but because it’s in a blogging niche we know there is people that are interested in writing. We actually may be able to essentially hire visitors coming to these websites as interns for [inaudible 00:40:43] right? So it would become this circle of we are actually generating traffic for internship to work on these websites that maybe they came to originally, right? Steve: That’s pretty ingenious actually, because like the tedious part or the time consuming part is the content. And by getting these interns to do the content, yeah it seems like a pretty good exchange. So how many interns do you have? Spencer: It varies. So we’ve done a few different internship sessions, four week sessions, and we bring on — I mean like the first one I think we had 20 or so. And this next one we are hoping to have, I believe we are trying to hit 60. So we are bringing in a lot. And we actually have a whole team, there is a group of 10 guys that are happy to manage this whole process that are available via Skype, and are answering individual questions. So we have quite a team behind us making sure interns are taking care of it, going through all the processes and procedures that we’ve set up for this. Steve: So I’m just curious and this is just kind of me thinking about this, like what’s the incentive for them to just not take the training and just run and not do the content? Spencer: So the way that we sort of make them have some skin in the game is we do ask them to put down a deposit. So they put down a deposit of a few hundred dollars, and then once their work is completed, once they’ve done their 10 articles we return the few hundred dollar deposit. So that’s sort of our way to make sure they are committed to the process. And we’ve always returned the deposits and we have no desire to keep their money. Sometimes it takes a little longer than four weeks to get them to finish what they are doing or whatever. Or if they really complain, we just give it back to them anyways. So [inaudible 00:42:42] guys, but yeah that’s our incentive for them to stick around. Steve: That also implies that they all have to be able to write? Spencer: Yes, we actually have them go through an application process. So we have them write a very short like 300 word response to the question. And then using that we judge okay can they write well, and if they can’t we don’t bring them on. However we may start allowing some people to come in and train them the process to actually outsource the content, but we haven’t really done that so maybe [inaudible 00:43:19] into that right? Spencer: But there is certainly a way even if you don’t speak or write well you can outsource content. Steve: So they don’t require any domain specific knowledge at all? Steve: Wow, that’s an interesting model. And it sounds like the results that you’ve been getting have been fairly quick. Like three months is a very short amount of time in the SEO world, right? Spencer: Yeah it absolutely is. So we do a couple of other things like I said. Content really is a huge piece of that, but then we go into the website and make sure it’s all SEO friendly and maybe speed up the website and do some other things so it loads faster. And all of those things combined along with some like building that we do to just really boost the website. Steve: Cool man, so where can people go if they are interested in your internship? Spencer: Yeah, so people can head over to authoritymahcine.com, and maybe we’ll make sure we have a link so that we can track them back to you. So let’s go ahead and do authoritymachine.com/Steve. If people go to that, we’ll make sure to have a specific page for any podcast listeners here. So yeah authoritymachine.com/Steve and they can see the different options that are there, internship or training and learn more about it. Steve: Cool man, yeah it sounds like a great way to learn without having to pay any money and actually get some experience in the process. Spencer: Exactly, and I think what a lot of people really like is the fact that they can see the actual websites, right. They can go to the real domain; they can see what we’ve done to that website. And then of course through the training they learn, well here is what we are going to do to grow the website. And really it can be a great way for people to gain some knowledge and skills to apply to their own site. I mean the fact of the matter is we really are teaching what works, because these are our own websites that we purchased, and we want to return our money, right? And so we are definitely teaching interns what we believe are the best processes and procedures for doing these sorts of things. So we feel like it’s a win-win, and hopefully the interns that come in feel the same way. Steve: Cool and in terms of your long-term plan for these sites, are they to sell them like your flipping sites or are you planning on just keeping them? Spencer: Yeah the long term I mean we may hold on to some of them, but for now at least we feel like probably after a year or so of holding these sites we’ll probably turn around and flip them. Steve: Okay wow, so you are really embracing this whole buy and sell model? Spencer: Yeah, it’s kind of fun. Steve: Awesome, well hey thanks for sharing the details of your sale of Long Tail Pro. I’m honored that this is the first podcast that you’ve talked about it. Spencer: Yeah absolutely, no it’s been great to chat about it. Steve: Cool well thanks for coming on the show Spence, and we’ll see if — I’m sure a lot of people listening are going to be interested in the Authority Machine, so cool man. Spencer: Hey I appreciate your time very much, and I appreciate the listeners are sticking around and let us chat about it. So thanks again. Steve: Cool man, take care Spencer. Spencer: All right bye, bye. Steve: Hope you enjoyed that episode. I have been a long time user of Long Tail Pro, and it’s probably a tool that I use the most often for my online businesses. Now I have had several people on the show who have bought businesses but not sold them. And it was interesting to get the perspective from Spencer, and his motivations behind the transaction. For more information about this episode, go to mywifequitherjob.com/episode136. Once again I want to thank sitelock.com for sponsoring this episode. If you run your own hosted online store, or any website for that matter that handles monetary transactions, you should give SiteLock a look. They can also help your site with site speed issues as well. Did you know that ecommerce sites that take longer than 5 seconds to load often shed customers? I’m glad I found this article. This is really helpful especially to those who are starting their business. In just scrolling your internet can really help you in doing your online business.